Originally hailing from the jungles and swamps of the province of Black Marsh, and the Blackwood Forest which spans the provinces of Cyrodiil, Black Marsh and Elsweyr, the Blackwood Company were comprised primarily of Khajiit and Argonian mercenaries. The name of the faction was derived from two sources; the Blackwood Forest region, where they were historically most active, and the "thoghatt" or "black charcoal warriors" of Khajiit tradition. The Company was founded by a Khajiit "Pakseech" (or 'clan chair') of the warriors named Ri'Zakar, along with an Argonian mage and Hist tree shaman named Ajum-Kajin. The Khajiit and Argonian Blackwood Company leadership were veterans of the Arnesian War between Black Marsh and Morrowind, while others were former soldiers of the Imperial Legion sent by the Emperor to reclaim lost territory in the Black Marsh province who ultimately deserted Imperial service. 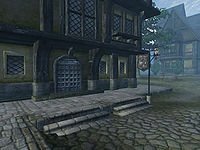 Although there were a large number of mercenary groups in Black Marsh, where the Fighters Guild had little or no presence, the Blackwood Company were the most successful of these and the only one of which made the transition into the Imperial province of Cyrodiil and the only other faction to compete directly with the more established Fighters Guild there. It was at this time that the Blackwood Company commissioned its own modified set of heavy armor, strengthened to be tougher than the iron and steel armors commonly used by the Fighters Guild. The Blackwood armor was hardened with traditional beastfolk techniques and engraved with the emblem of a sword and axe at the roots of a Hist tree, a foreshadowing of the source of their secret strength. Whereas Cyrodiil's Imperially-chartered Fighters Guild operated by a strict and rigid set of laws, standards and ethics, the Blackwood Company did not, letting it be known that they would accept any contract without moral obligation, and would accept any initiate into their ranks without any screening process and regardless of their past or whether they had a bounty on their heads, and so forth. Although the Fighters Guild considered the Blackwood Company "rank amateurs", this gave the Blackwood Company some obvious advantages over the Fighters Guild, as they could take jobs that the Guild refused and others at a lesser price. The Company were soon expanding by undercutting the Guild in price for contracts, even acquiring not only their work but even their members when the Fighters Guild began to find themselves short on contracts and unable to give its members work. The very existence of the Fighters Guild was jeopardized by the Blackwood Company, with the latter gaining upwards of a hundred operatives at its peak, and mockingly setting up their Company Hall across the plaza from the Leyawiin Fighters Guild Hall from which they were stealing most of the contracts. The Guide to Leyawiin, written when the Company first commenced operation there, describes the Company in a very positive light, although it does so for every aspect of the entire city. The Company also maintained a remote field headquarters much further into Cyrodiil, in the Great Forest, at Glademist Cave. A dozen Company members manned the Blackwood Company Hall under Pakseech Ri'Zakar, while the mage Ajum-Kajin ran their field operations at the Glademist Cave outpost with ten Company agents, including some veteran Colovian Imperial mercenaries who had joined the Company. Despite the fact that there were reports of Blackwood Company mercenaries being reckless and indiscriminate in their methods, and even causing needless damage to person and property during the fulfillment of a contract, the citizenry were wholly unwilling and afraid to make any official complaints against the Company and so no immediate Imperial action was taken against them with the Imperial Legion distracted with the Oblivion Crisis. When the Fighters Guild was contracted by the wizard Argoth to retrieve an artifact from the renegade Azani Blackheart, fifteen of the twenty-strong party never returned from the unsuccessful mission, including the Guildmaster's son, Vitellus Donton. The Blackwood Company then appeared with the artifact, claiming the reward from Argoth; but Argoth himself soon turned up dead, and it transpired that the Blackwood Company had made a counter-deal with Blackheart. During the Oblivion Crisis in 3E 433, the Fighters Guild was spilt in two with the deaths of the sons of the bereaved and withdrawn Guildmaster Vilena Donton, at the hands of Blackwood Company berserkers; with Guild members turning to a demoted Modryn Oreyn. Oreyn made it his priority to uncover the secret of the Blackwood Company's strength, a well-guarded secret within the Company, as evidenced when, during interrogation, Ajum-Kajin committed suicide by equipping the Blackwood Ring of Silence rather than reveal it. Modryn Oreyn secretly tasked the Hero of Kvatch with this. The Hero of Kvatch briefly joined the Blackwood Company as part of an infiltration to learn the Company's secrets. After reluctantly taking a ritual initiation drink supplied by the Blackwood Company, the Hero of Kvatch unwittingly took part in the slaughter of the townspeople of Water's Edge, believing the townsfolk to be the very goblins they had been contracted to eradicate. Through this tragedy, the Hero of Kvatch learned that Blackwood Company members used the potent and intoxicating sap from a Hist tree hidden in the secure Blackwood Company Hall basement in Leyawiin. 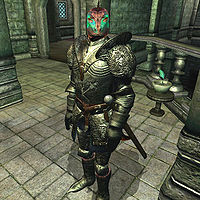 Blackwood Company members used the sap, often used by master Argonian shaman to enter a trance-like state, both in ritual and to give them chaotic "bravery" and boost their combat prowess. However, when consumed by a non-Argonian, Hist sap causes hallucinogenic effects which can send the drinker into a bloodlust. 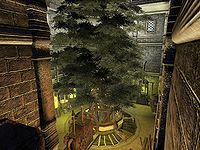 Furthermore, the Hist tree that the Blackwood Company used was revealed to have been smuggled directly from Black Marsh, but was sick or corrupted in some way, meaning that the sap caused a crippling dependency that would send even Argonians into murderous frenzies. The Hero of Kvatch gained entry and jammed the elaborate steam-powered mechanism which was in the process of extracting and pumping the sap, which in turn set fire to the tree and the sap stores, after which the Hero killed the remaining Company members. With the threat of the Blackwood Company removed, Vilena Donton retired, her last action to reward these actions by declaring the Hero of Kvatch the new Guildmaster of the Fighters Guild, with Modryn Oreyn to run Guild operations in their stead. ^ A New Guild for Fighters? This page was last modified on 13 February 2019, at 04:59.